The PMA methodology is not the property of any single organization, person, or group. 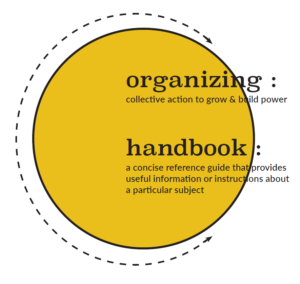 This Organizing Handbook is designed for organizers, educators, activists, and community members who want to use the Peoples Movement Assembly methodology to build power in their community, on their frontline struggle, and in our social movements. Social Movements throughout history and around the world have used assemblies to make decisions. Movements, particularly in the Global South – Africa, Asia, and Latin America have used assemblies to advance the practice of people power, self-determination, and governance. In the 21st century, social movements are building power through radical democratic, participatory spaces that respect and trust the collective voice of people in struggle. World Social Forums are semi-annual convergences that create open space for movements to share, connect, and strengthen beyond the boundaries of political parties, initiated in resistance to the World Economic Forum. The Social Movement Assembly was created to make and implement movement decisions within the World Social Forum. The Peoples Movement Assembly is a political methodology born out of the Social Movement Assembly process and the United States Social Forum (more history on pages 6-7). Over the last decade, countless organizations and struggles have contributed to the collective efforts to build movements that liberate all people using the Peoples Movement Assemblies. The PMA Handbook is a fusion of that thinking, experience, and work. Section 1: OVERVIEW The Handbook includes a historical timeline and overview of the PMA process in the U.S. in order to locate the assembly within a movement continuum and connect to current examples. Section 2: GLOBAL CASE STUDIES The PMA Handbook includes snapshots of historical and current liberation movements using assemblies and assembly practices to grow power. Section 3: HOW IT WORKS Assemblies are different depending on the group, the purpose, and the function. The PMA Handbook offers insight into the fundamental characteristics of assemblies that are useful for the organizing process Before, During, & After the Assembly. Section 4: TOOLS & TIPS The PMA Handbook offers resources including planning tools, sample agendas, methodology descriptions, notetaking tips, and guidelines for synthesis development. Additional information is available in the downloadable copy including tips and how-tos. Our movements need collective action plans, governance, and infrastructure. Social movements are rising. 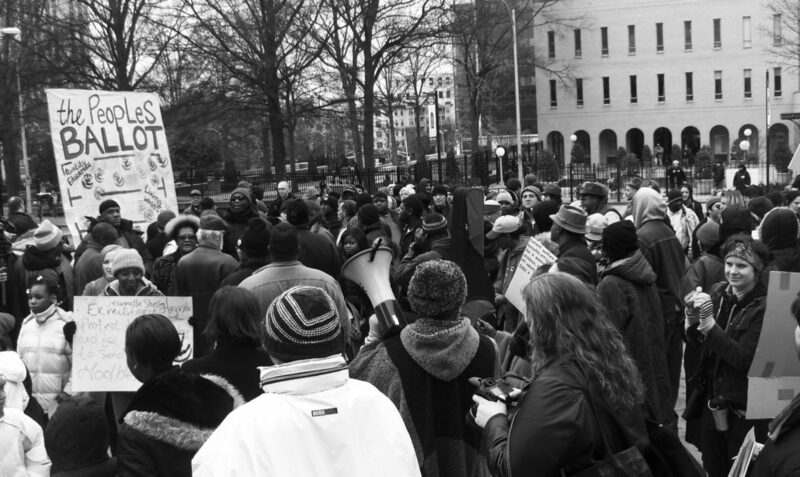 Social movements exist in the U.S., yet are often disjointed and working separately. We need to build stronger collaborative social movements by deepening our understandings of our common goals and seeking to intersect across issues, frontlines, and regions. We need autonomous, independent social movements with their own social and economic agendas. Current social, economic, and political systems are designed to fail our communities. 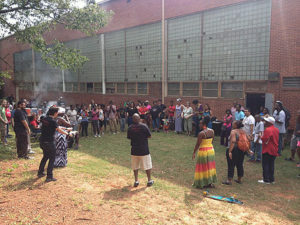 Assemblies build parallel democratic infrastructure to determine community action plans. Multiple strategies and a diversity of tactics are more effective. Attacks on our communities are part of reactionary strategies to dismantle public infrastructure. Multiple strategies engage more people and increase our collective potential to respond, fight back, and win. Reforms are not enough. We need long-term vision and strategies for liberation. We need to envision alternatives and create new structures to initiate the world that we want and deserve. We need to develop collective strategic plans that create immediate results and also lead to long-term systemic social justice. We need to move from single issues to convergence across frontlines. Leadership and power must be held by people who live and experience injustice. Our movements need to be led by people who are affected by social control, oppression, racism, and economic displacement. This guiding principle and practice strengthens the effectiveness of our movements and reduces cooptation and exploitation. What is the Peoples Movement Assembly? The assembly is a constellation of social movement organizations and people that seek to govern themselves. It is not a network, not a coalition, not an alliance, and not a political party. It is inclusive and not exclusive to one political line or ideology. It is a convergence of social forces. The assembly process is based on the facilitation methodology of collective critical thinking and analysis, resulting in a synthesis that represents the sum organic total of all of the ideas and commitments. The social movement assembly results in action based on that synthesis. The assembly is a decolonizing process. The assembly process is based on a theory of change that people can create processes that dismantle colonial and neocolonial systems while at the same time creating a new society. At the heart of the assembly process is a project to dismantle patriarchy, racism, poverty, capitalism, oppression, exploitation, and violence while replacing those systems with movement governance and liberated institutions. 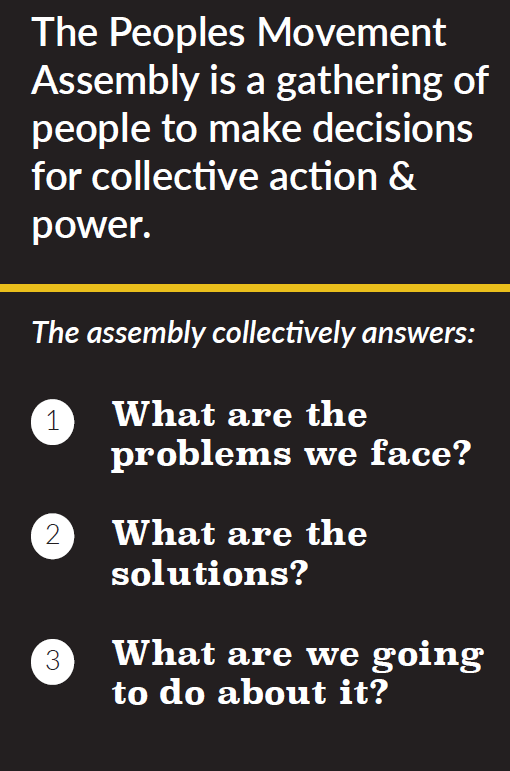 The assembly creates an open space for people to enter social movements and become active participants and leaders. The assembly is facilitated to encourage maximum participation in order to practice direct participatory democracy at the community level, within particular frontlines, and across social movements. The assembly is multiracial, multigenerational, multi-ideological, and multi-gendered. The assembly brings all the voices together in a circular fashion and engages the thinking, experiences, and visions of all the participants in order to synthesize and collectively agree on action steps. 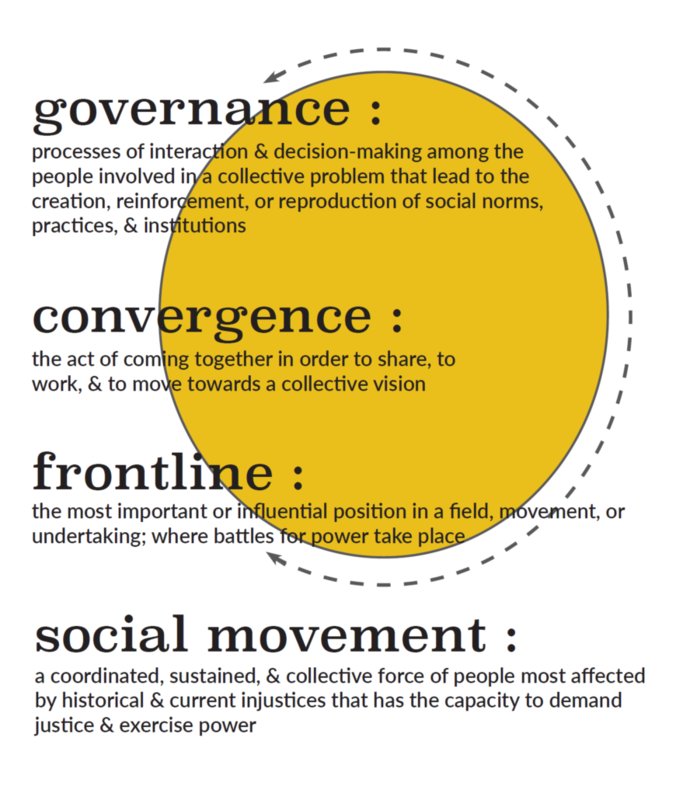 Assemblies create community governance, frontline convergence, and movement governance. are organized to bring together people in a particular neighborhood, city, town, constituency, or population in order to share analysis, collaborate, develop & implement action plans that grow community power. are organized to bring together people who work on a similar frontline of struggle in order to share analysis, collaborate, develop and implement action plans that grow cohesion and unity for frontline power. Border Wall Assemblies (2006) Gulf Coast Climate Justice Assemblies (2010-16); Formerly Incarcerated Peoples Movement Assembly (2011). are organized to represent communities, frontline struggles, and organizations in order to share analysis, collaborate, & develop and implement action plans to convene and grow movement power. 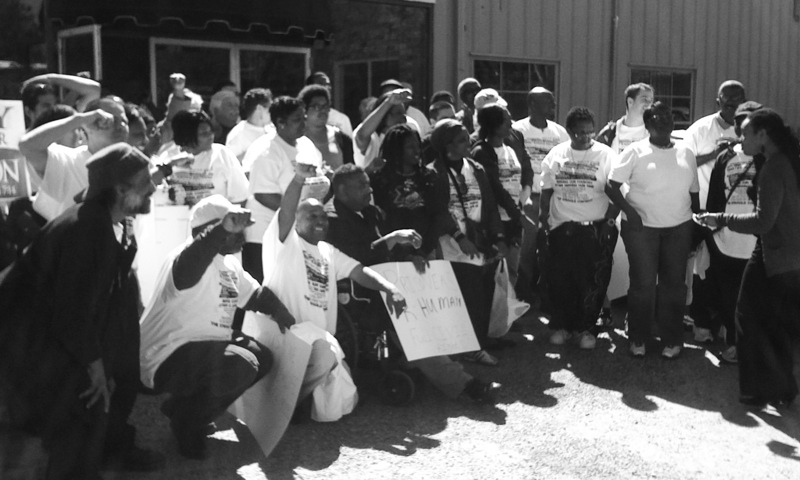 Held in Montgomery Alabama, The Ordinary Peoples Society (TOPS) anchored a national assembly of people affected by mass incarceration. 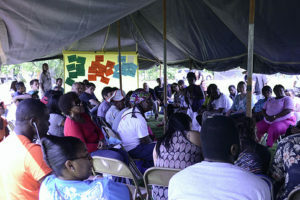 Held at the second U.S. Social Forum and anchored by Kindred Collective, the HJ PMA developed a historical timeline & launhced regional healing justice efforts. 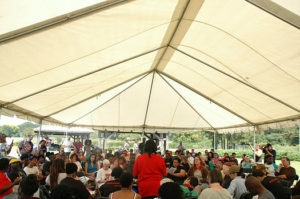 As part of the Global Day of Action, Georgia organizations convened over 600 people to caravan through Atlanta, rally at the capitol, and assemble to develop plans of action. Remember the Peoples Movement Assembly is NOT neutral. The PMA is based in a clear, political analysis that considers the history of place and people, the current conditions, the lived experience of the participants, and relationships of power. Place and space matters. The PMA reflects the local leadership, culture, and practices of the participants and organizers. The PMA includes attention to food, culture, music, physical set-up, opportunities to interact, how children are engaged, how bodies move through the space, and ceremony. The PMA is multi-ideological and creates space for a plurality of understandings and worldviews. The PMA is based in the capacity and political will of the anchors that organize and create the space. Anchors, as groups or organizations, accept the responsibility of coordinating or moving the collective agreements forward into action. 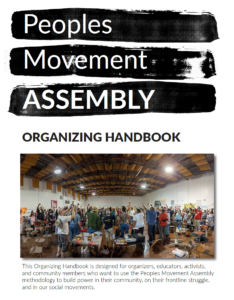 This updated Handbook reflects the learnings of hundreds of organizers practicing the Peoples Movement Assembly from 2006-2016. Produced in partnership with the Southern Movement Assembly anchors and leaders: Alternate ROOTS, Black Workers for Justice, Concerned Citizens for Justice, Crescent City Media Group, Georgia Citizens’ Coalition on Hunger, Gulf Coast Center for Law & Policy, National Council of Elders, New Jim Crow Movement, Southwest Workers Union, SpiritHouse, The Ordinary Peoples Society (TOPS), University Sin Fronteras, and Women Watch Afrika.